Ever wonder what’s kept you from reaching higher levels of fulfillment? Maybe you just didn’t get the e-mail. 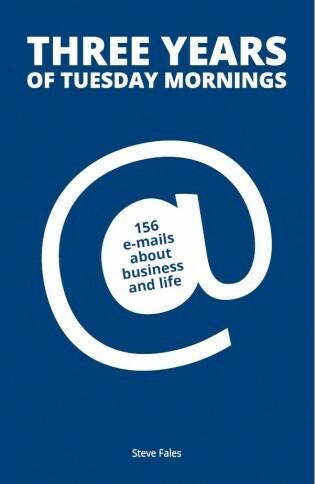 In Three Years Of Tuesday Mornings: 156 e-mails about business and life, entrepreneur, speaker,life coach, and endurance athlete Steve Fales shares nuggets and insights from weeklymotivational messages that were originally sentto his advertising agency employees. From high level visioning to specific, practical tips (like learning how to manage time, deal with stress, or say “No”), Three Years Of TuesdayMornings opens doors to the breakthroughs that matter most. This book provides simple and profound direction to take you where you want to go. And you don’t even have to wait until Tuesday. Available from Amazon – Click Here.